A Kakuro puzzle is a variant of Sudoku and a extremely addictive fashion game. The Kakuro is a crossword puzzle that uses numbers instead of words. Search them. 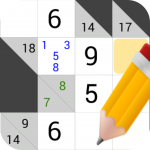 This simple game is one of the most addictive puzzles in the market, even more than Sudoku. So if you’re already bored of Sudoku or crossword puzzles, you must try this hiper-addictive game. The puzzles are generated automatically, and you can choose three level of difficulties, as well as three sizes. Enjoy this summer Kakuro Cross sums, a game to boost your mind and entertain you for hours.